Honey Crisps, Pink Ladies, and many other apple varieties add unique seasonal flavor to fall dishes. Fall harvest season is in full swing and apples are a plenty. Many varieties that you can’t always find most of the year are on grocery shelves and in farmers markets all over Chicagoland right now. Whether you enjoy them simply as a snack or in a sweet or savory dishe, apples are versatile. Plus, the different varieties can add subtle flavor differences in your recipes. So, be sure to experiment as you sample them all this season. Here are few of my recipes and a couple from some of my facebook friends. Combine brown sugar, cinnamon, lemon zest and salt in a large bowl. Add sliced apples and toss to combine. Meanwhile, pour the melted butter over the breadcrumbs and mix with your hands to combine. Sprinkle 1/4 of the breadcrumbs over the bottom of a square ovenproof casserole. Spread 1/3 of the apple mixture over the bottom and top with another 1/4 of the breadcrumbs. Alternate remaining apples and crumbs in similar quantities, ending with a layer of crumbs on top. Mix lemon juice and water with any remaining juices and sugar in the bowl used for the apples. Pour combined mixture over the top of the casserole. Cover tightly with aluminum and bake for 1 hour. Remove aluminum and bake for an additional 30 minutes. Remove from oven and serve warm with vanilla ice cream. Core the apples and cut them into 1” cubes. Place apples in a large bowl and toss with the lemon juice. Add chicken, celery, grapes, raisins and walnuts. Mix yogurt and cider in a small bowl and pour over salad. Stir ingredients together and add salt and pepper. Serve over a bed of lettuce and season with additional salt and pepper, if desired. Preheat oven to 350 degrees. Season the pork chops with salt and pepper and set aside. Heat olive oil in a large saucepan over high heat. When oil is hot, add the pork chops and sear each side, about 1-2 minutes. Place chops in an oven proof casserole. Add onions, potatoes, sage and apples. Pour chicken stock over all the ingredients and then sprinkle brown sugar on top. Place a cover on the casserole (or cover with aluminum) and place in the oven for 45 minutes. Remove from oven and allow casserole to rest for 10 minutes before serving. Combine all ingredients together and mix until well blended. Serve with your favorite sliced apples. This is a great apple dip. Drain pineapple and save juice. Combine pineapple, peanuts and marshmallows and refrigerator overnight. Combine pineapple juice, vinegar, sugar and flour. Heat in a saucepan until thick. Allow mixture to cool and then refrigerate this overnight in a separate container. The next day, core and chop the apples into medium sized cubes. Place apples in a large bowl and add the two refrigerated mixtures and the non-dairy topping. Mix well and serve chilled. Use your hands to crumble together the flour, sugars, cinnamon, salt and butter until well blended. Divide crumb mixture in 2 parts. Stir baking soda and buttermilk into 1 part of the crumb mix. Pour into an 8-inch round baking pan. Top with Roman apples then top the apples with the remaining crumb mix. Bake until golden brown and cake batter is firm, about 45 minutes. In Pennsylvania Dutch country, Apple Dumplings are served warm, in a bowl of milk. You can use Stayman Winesap apples if available, or Golden Delicious, Jonathan or Granny Smith apples instead. 1/2 cu Brown Sugar, firmly packed. Mix the brown sugar, cinnamon, and flour together and set aside. Cut each rolled piecrust into 3 equal sized pieces, yielding 6 total. Make a ball out of each piece and then roll it out again to form a circle large enough to cover each apple. Place 1 apple in the center of each piece. Fill the empty core space with the brown sugar, cinnamon and flour mixture. Bring up edges of the dough and overlap at the top to completely cover the apple. Press the edges together to seal. Cut a slit through the layers of dough at the top of the apple top to allow steam to escape while baking. Preheat oven to 400 degrees. 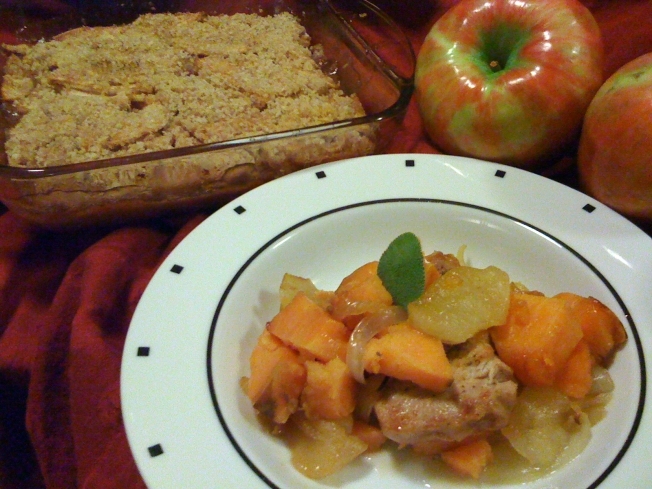 Arrange the apple dumplings in a shallow baking dish. Brush the tops with 1 slightly beaten egg white and sprinkle with sugar, if desired. Bake for 20 minutes. Lower heat to 350 degrees and bake for an additional 15 to 20 minutes or until the crust is a light golden brown color. If the crusts start to brown too quickly, loosely cover the dish with aluminum. Thanks again to Paula Howland Cree, Chris Blomquist, Martha Davidson Schlesseman, and all of my facebook friends for their recipes and suggestions. Please keep them coming! If you have any questions or comments, please send me an email at wayne@waynesweekend.com or join me on facebook.